With the guidance of the Diversity Task Force, Chi Alpha is strategically reaching Historically Black Colleges and Universities (HBCUs) to start new campus ministries and to promote a student body that represents the diversity of the Body of Christ. The Minority Missionary Fund (MMF) is helping minority campus missionaries get the financial support they need to fulfill God’s calling to reach the university. Among those who have benefited is Virginia native Marcus Floyd, who graduated in 2016 from Virginia Commonwealth University with a Bachelor’s in Exercise Science. In the fall, after graduation, he began the process of pioneering a Chi Alpha ministry at the historically black Virginia Union University (VUU). Marcus shares his testimony on how both the Diversity Task Force and the MMF have helped him personally. I had no church experience whatsoever. I never went to church, never went to Bible study. It wasn’t until graduating from high school that God put it on my heart to really know who He is and what Jesus had done for me. For me, Chi Alpha was my very first encounter of authentic Christian community and being surrounded by people who would help guide me and meet me where I was. They showed me what it was like to live a life loving God and following Jesus in an everyday lifestyle. How has the Chi Alpha Diversity Task Force guided you along the way? They have helped to show me that I’m not alone as a minority missionary. I learned that I can have a huge impact on reaching people for Christ, my ethnicity matters, and God wants me to reach people from my ethnic background. It allowed me to open my eyes to see VUU. XA Diversity has really equipped me to talk about and champion Kingdom diversity that’s found in Scripture and I have them as a resource to fulfill the calling that God has placed in my life at VUU. How has the MMF helped support your missionary needs? The MMF helped me to handle both my personal and vocational needs and not worry about how I was going to work as a missionary. It allowed me to focus my attention on reaching students for Christ and to be the campus missionary God has called me to be. If it wasn’t for the MMF, I would not have been able to be a Campus Missionary-in-Training (CMIT) and I would not have been able to be sent on my college campus. Not just my campus, but I wouldn’t have been able to be a part of pioneering Chi Alpha at VUU. This past spring semester, we became an official student organization at VUU! Praise God! What role do you see minority missionaries playing in Chi Alpha in the next few years? I see them speaking the Gospel, the Kingdom of God, into hard to reach places that have not been reached before. 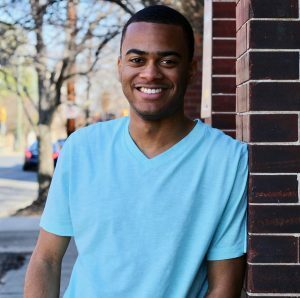 Throughout our country, there’s been a lot of turmoil and toxicity, and I believe Chi Alpha minority missionaries can really step into the areas of racial reconciliation on the college campus and uniquely minister to students who may be discouraged or feeling hopeless. They will be there to show Jesus is light, the Kingdom of God is relevant, and speak into those very areas of hurt, injustice, and pain they’ve experienced.